Nothing cleans commercial carpet better! So you may have wondered. Why do most of the Releasit detergents contain a built-in fluoro-chemical? Your first thought might be that the fluoro-chemical (called Soileze) has been added to increase soil-resistance. And if that was your guess, you’d be partially correct. There are actually 4 REASONS why the Soileze fluoro-chemical has been added to several of our key products such as Encap-Clean DS2, Encap-1, Encap-Punch, and Encap-Spot. The Soileze fluoro-chemical helps to lowers the surface tension of the detergent. In fact, good detergent chemistry contains surfactants that are intended to lower surface tension of the water, allowing the detergent to wet-out the soil more readily. 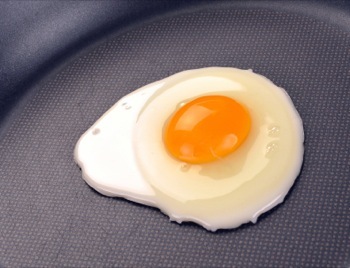 Lowering the surface tension can be compared to the way an egg slips off a non-stick frying pan - it’s because the surface tension of the pan is lower than the surface tension of the egg. The additional lowered surface tension imparted by the Soileze fluoro-chemical helps these detergents to do their cleaning more efficiently. Another reason for adding Soileze fluoro-chemical is that it helps the brittle crystallized encapsulation polymer to release more easily from the carpet fiber. A third benefit from the Soileze fluoro-chemical is that the fluoro-chemical helps to slow the wicking process. And finally, a final benefit is that it adds a measure of soil-resistance to the carpet. This is not to say that the level of soil-resistance will be as great as a stand-alone application of concentrated Soileze fluoro-chemical, however the benefits of soil resistance from the built-in Soileze fluoro-chemical, along with the soil resistance of the Crystalon3 encapsulation polymer provides a carpet that will stay clean longer between cleanings. So there you have it. The Soileze fluoro-chemical benefits our detergents in 4 unique ways. In fact it’s part of the reason why Releasit encapsulation products are in a class of their own in the industry. We could make our products less costly if we didn’t build the Soileze fluoro-chemical, but we feel the benefits far outweigh the added investment.